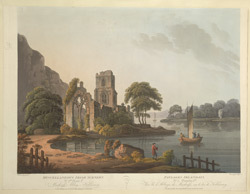 View of Muckross Abbey on the Great Lake of Killarney, Ireland. An abbey stood on this site in the 6th century, built by St Fionan, housing monks from the Innisfallen island monasteries, however this was destroyed by fire in the 12th century. Donal MacCarthy was responsible for building a new abbey here in 1448; the work took lnger than expected and was not completed for over 50 years. It is a typical Franciscan abbey with the cloister, nave and transept on the lower floor and the kitchen, dormitories and refectory on the upper storey. The Cloister, with the sides being built at different times, surrounds a yew tree which is thought to be older than the Abbey.